Famous for its association with three of the most prominent 16th-century Englishmen, Sir John Hawkins (1532-1595), Sir Francis Drake (1540-1596) and Sir Walter Raleigh (1554-1618), Plymouth (pop. 253,000) played a major role in Britain's naval history. With one of the finest natural harbours in the world, the city's Devonport Dockyard remains Western Europe's largest naval base (but second in importance in Britain after Portsmouth). Modern Plymouth is a unitary authority which incorporates the neighbouring towns of Devonport and East Stonehouse. Due to its naval importance, the town was heavily bombed by the Luftwaffe during WWII, and its centre is now an amalgam of non descript concrete reconstructions - although a few interesting buildings have survived. People born in Plymouth are known as Plymothians or less formally as Janner. In the Royal Navy, "Guz" is a nickname for Devonport. Plymouth was founded at the estuary of the rivers Plym, Tavy and Tamar. It developed into a town in the 15th century and saw its heyday in the next century, when it served as Francis Drake's base for his voyage around the globe (1577-1580) and to defeat the Spanish Armada (1588). It is said that when alerted of the approach of the Armada, Drake insisted on finishing his game of bowls on Plymouth Hoe before setting sail to defeat the Spaniards. Drake's fleet chased the Armada up to Calais, and aided by a storm, managed to sink 51 Spanish vessels without losing any. 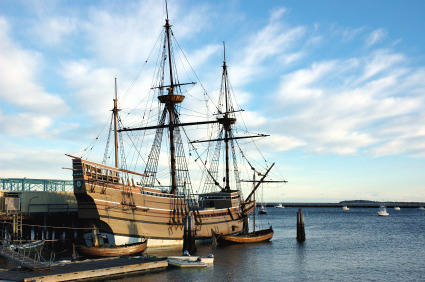 In 1620, the Pilgrim Fathers, a group of 102 puritans who had broken away from the Church of England, embarked aboard the Mayflower in Plymouth, with destination the newly founded colony of Virginia. Forced off course by the weather, they finally landed near present-day Provincetown (Massachusetts), and settled at what they named the "Plymouth Colony". It was also from Plymouth that Captain James Cook set sail on his three voyages to the Southern Hemisphere that led him to Tahiti, New Zealand, Australia, New Guinea, Antarctica and Hawaii. Charles Darwin's HMS Beagle also set off from Plymouth, and so did the ships who took convicts and colonists to Australia in the 19th century. The park and seafront promenade known as the Plymouth Hoe, which commands great views on the Plymouth Sound (i.e. the Bay of Plymouth), is the first place to visit in town. It is here that Francis Drake supposedly played bowls before routing the Armada, and a statue now commemorates the man. Still on the Hoe, Smeaton's Tower was built in 1759 by John Smeaton on the Eddystone Rocks, and was the world's first lighthouse built using 'hydraulic lime' (a form of concrete). When it was discovered that the rocks upon which the lighthouse stood were becoming eroded, it was dismantled and moved to the Hoe in 1877 as a memorial, and replaced by a new one in 1882. Beside the lighthouse, the Plymouth Dome has a very instructive overview of the city's history from the great explorer to the WWII blitz. There is a recreation of an Elizabethan street with dummies complemented by sound and even smell. The Smeaton's Gallery concentrates on the lighthouse's history. During the Civil War, Plymouth was the only city of the South-West to support the Parliamentarians. 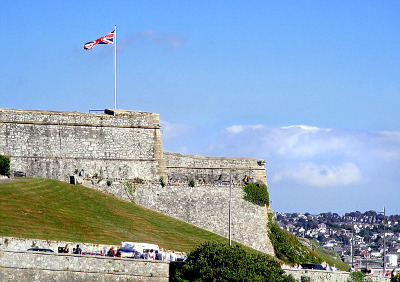 That prompted Charles II to built the Royal Citadel (built 1665-1670), between the Hoe and Barbican, to keep control over this strategic port. There are guided tours on Tuesdays at 2:30pm (1h15min, £3) between May and September. Locked between the Citadel and Sutton Harbour, the Barbican district is the heart of old Plymouth and now mostly houses shops and restaurants. Most of the buildings on New Street have survived WWII or were reconstructed in their respective Tudor or Jacobean style. The Elizabethan House is the only one that can be visited (open Wed-Sun 10am to 5pm from April to October; entry £1). The Pilgrim Fathers spent their last night in England at Island House, which is now the Tourist Information Centre. The Plymouth Mayflower has more information and interactive displays regarding the Pilgrim Fathers. The Plymouth Dry Gin Distillery has been operating since 1793 and is the oldest distillery in England. The official website has a detailed history of gin-making, as well as recipes, games and even a short movie. Right across the Barbican is the National Marine Aquarium, Britain's largest aquarium, with Europe's deepest tank. It was also the first aquarium in the UK built solely for the purpose of education. It has a stunning collection of seahorses, sharks and coral fauna and flora, among others. More toward the centre of town, the Merchant's House Museum, at 33 St Andrews Street, has more historical exhibits housed in a Jacobean building. The Devonport Dockyard were built in 1690 and cover an area of 2.6 km². It has 15 dry docks, 6km of waterfront, 25 tidal berths and 5 basins, and is the main refitting base for Royal Navy nuclear submarines. Plymouth has connections to most places in Devon and Cornwall. It is located at the end of the M5 motorways from Birmingham, Bristol and Exeter, which continues as the A38 to Bodmin. Trains run between Plymouth and London Paddington (3h to 3h30min, £44 super advance single), Bristol (2h30min, £37), Exeter (1h, £11.20) and Penzance (2h, £11). National Express coaches connect Plymouth to London (5h to 6h30min, £25), Penzance (2h30min to 3h20min, £6), Truro (1h45min, £5.25), Exeter (1h, £8.25), Torquay (1h, £7.50) and Bristol (2h30min to 3h15min, £23). Plymouth Airport has flights to and from London Gatwick, Bristol, Cardiff, Manchester, Liverpool, Leeds-Bradford, Newcastle, Aberdeen, Dublin, Cork and Jersey.